Fremont, CA – November 30th, 2018 – eSalesData announces year-end offer on a minimum purchase of mailing and email lists of $2000 and above. The discount ranges from 10% – 20%. 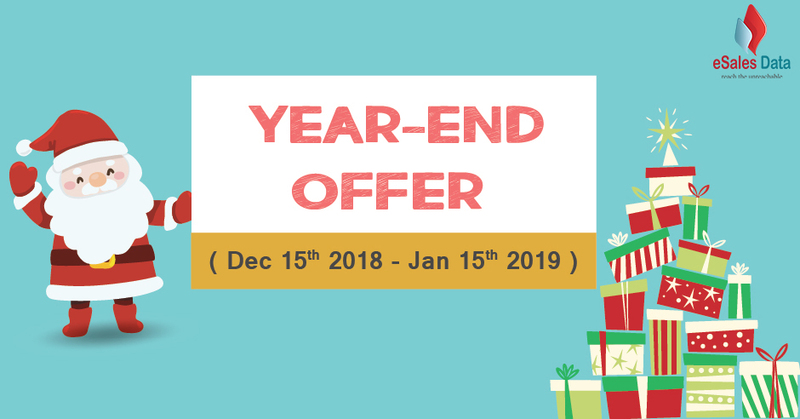 Marketers can avail this offer for a limited period that commences from 15th December 2018 and end on 15th January 2019. “The end of the year is approaching. A lot of businesses have to struggle with allocating their unspent budget during this time of the year. Even after spending a lot throughout the year around the festive season, they still don’t know what to do with the left-over resource. That is why we have in store a year-end deal to address their challenges. By investing in our data, not only their money is put into good use, but also they get access to our result-driven, highly lead generating marketing data at an affordable price. What more they can ask for isn’t it?” says Tony Huff. eSalesData is a leading marketing company known for its high-quality data and online marketing services. The company provides B2B data to support the marketing campaigns of companies of all sizes. From email address to phone numbers, a comprehensive set of information is provided to help marketers establish one-to-one communication with business prospects across the globe.